Anecdotes about Milo's almost superhuman strength and lifestyle abound. His daily diet allegedly consisted of 20 lb of meat, 20 lb of bread, and eighteen pints of wine. Pliny the Elder and Solinus both attribute Milo's invincibility in competition to the wrestler's consumption of alectoriae, the gizzard stones of roosters. Legends say he carried his own bronze statue to its place at Olympia, and once carried a four-year-old bull on his shoulders before slaughtering, roasting, and devouring it in one day. He was said to have achieved the feat of lifting the bull by starting in childhood, lifting and carrying a newborn calf and repeating the feat daily as it grew to maturity. One report says the wrestler was able to hold a pomegranate without damaging it while challengers tried to pry his fingers from it, and another report says he could burst a band fastened around his brow by inhaling air and causing the temple veins to swell. He was said to maintain his footing on an oiled discus while others tried to push him from it. These feats have been attributed to misinterpretations of statues depicting Milo with his head bound in victor's ribbons, his hand holding the apple of victory, and his feet positioned on a round disc that would have been fitted into a pedestal or base. 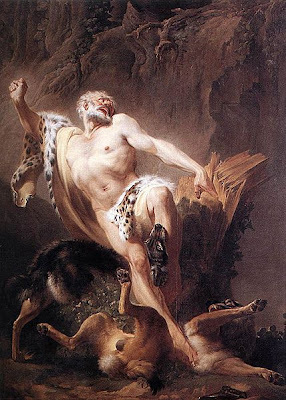 The legends about Milo of Croton are too many to count, to the point where his death has been magnified to tell a story of how he was devoured by bears while trying to tear a tree apart. Just ridiculous, but most of our great superheroes are. So here's a quick salute to you, Milo of Croton. May your Samson ways continue to resonate, er, strongly throughout history!